The second-generation Eufy BoostIQ RoboVac 11+ Self-Charging Robotic Vacuum Cleaner is one of the best new robot vacuums that hit the market last year. The original model was already fantastic, offering terrific suction and great performance on hard flooring as well as low-pile rugs. The new model is better in every way, and yet it’s still shockingly affordable — especially today. 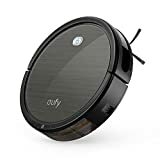 Clip the $10 coupon on the Amazon page and you’ll pay just $116.99 for this great model from a leading robot vacuum brand. There’s no telling how long this deal will last though, so definitely get in on the action while you still can. New and Improved: An upgraded front-bumper streamlines RoboVac’s profile to glide effortlessly under and around furniture while a reinforced suction inlet prevents wear. Upgraded 3-Point Cleaning System: A redesigned rolling brush –wider and reduces trapping rugs and sheets–, two side brushes, and powerful suction ensure a thorough clean.